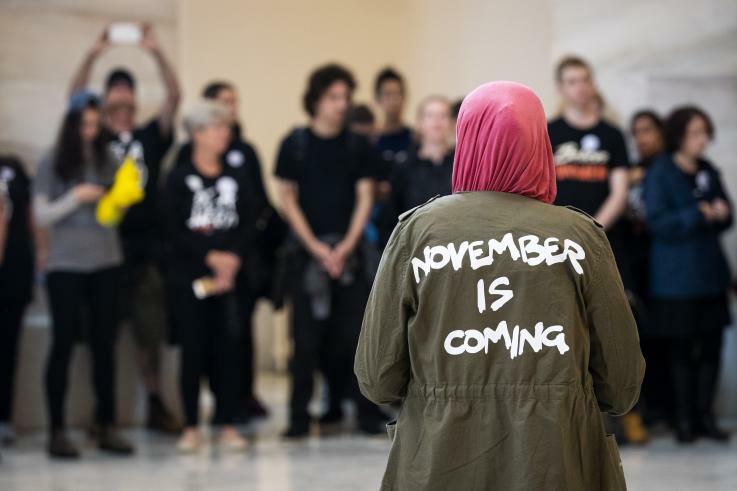 The Women’s Voices Women Vote Action Fund launched the map in the wake of Senate’s decision to confirm Justice Brett Kavanaugh to the Supreme Court despite multiple women accusing him of sexual misconduct in the 1980s. The nonprofit aims to support women’s rights and increase voting participation specifically among unmarried women, people of color and millennials, according to its founder and president, Page Gardner. Women’s rights activists have expressed concern that Kavanaugh’s appointment could spell the end of Roe v. Wade, the landmark 1973 decision by the Supreme Court that established a constitutional right to abortion. The organization’s website features an image of Christine Blasey Ford, the Palo Alto University professor who first came forward to accuse Kavanaugh of having sexually assaulted her in the summer of 1982, when both were still in high school. Voters looking to find out which candidates will fight for women’s rights, according to the organization, can scroll down to view the map. (View map on original article here). “With women voters expected to play a major role in determining the winners of the 2018 midterm elections, the WVWVAF is launching a new interactive map that helps voters find candidates that will fight for and protect women’s rights,” the non-profit, which claims to be nonpartisan, said in a statement sent to Newsweek. The map shows voters which candidates have been endorsed by pro-choice groups and provides links to where they can register to vote. “With the recent Kavanaugh news and controversy, this information is important to circulate now more than ever,” WVWVAF said. The map, which was developed by DemLabs LLC, divides the U.S. into congressional districts, showing which candidates have included women’s rights issues in their platforms. Those who have received endorsements from pro-choice groups have been listed with an asterisk beside their profile, such as Democratic candidate Beto O’Rourke, who is running to represent Texas in the U.S. Senate. Gardner said the organization wanted to specifically highlight pro-choice candidates in light of growing concerns around women’s reproductive rights in the U.S.
Gardner said the organization specifically aims to mobilize “the Rising American Electorate,” including people of color, millennials and unmarried women. Single women are one of the fastest-growing demographic groups in the country, Gardner said. The organization’s map was created in conjunction with #VoteProChoice, a group representing voters who have committed to electing representatives who have vowed to protect women’s reproductive rights.